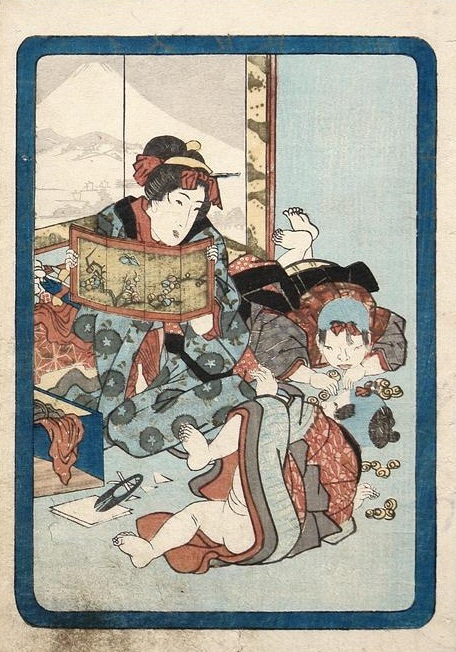 We have never come across a similar Japanese shunga print that examines the subject of two infants in this sexual context so explicitly as this koban-sized piece. The hairdue of these two little protagonists indicates that their age is around five years old. 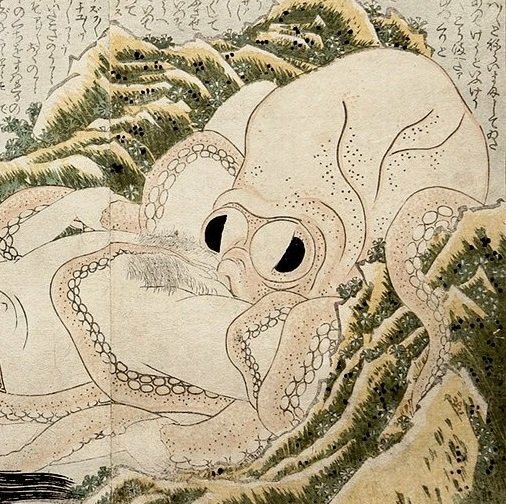 The attribution to Utagawa Kunisada is not only based on its stylistical elements but also thematically. Kunisada regularly added infants displaying their private parts in his shunga designs during this period (c.1820/30s). A more innocent scene (Fig.2.) from the same era shows a mother (teacher) teaching her playful infants how to imitate the plum blossoms depicted on the screen she is holding, only shows a subtle glimpse of a private part. The big screen behind them features a depiction of a towering Mount Fuji. These kids are playing ‘house’ with the young boy playing the husband and the girl the wife. Click HERE for some other subversive Japanese shunga prints with the shocking initiation of a young geisha…!! !